Cognitive psychology is a branch of psychology that focuses on how the mind works. The discipline aims to understand mental process, such as learning, perception, attention, reasoning, memory, language processing, problem solving, decision making and conceptual development. 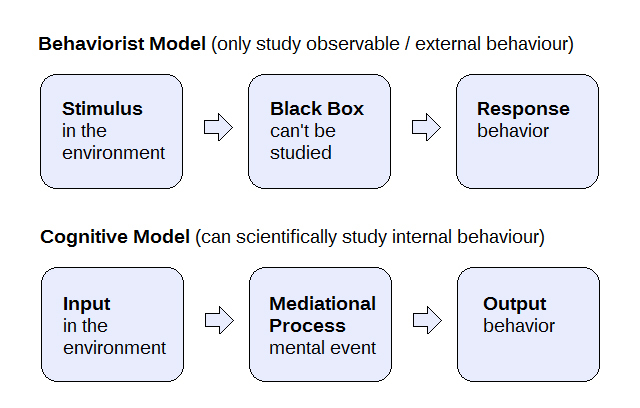 Much of psychological theory and study adopts a behaviorist approach. That is, a focus on external observable (stimulus and response) behaviour that can be measured objectively. Behaviorists believe that internal behavior cannot be accurately studied because it cannot be objectively measured or observed – we cannot see what's going on in a person's mind. In contrast, cognitive psychology focuses on the study of internal mental behaviour and mental processes, and believes these internal behaviours and processes can be studied and observed using various scientific experiments. Cognitive psychology is based on the assumption that mediational process occurs between stimulus (input) and response (output). The mediational (i.e. mental) event/process that takes place internally could be perception, memory, attention, etc. These mental processes are referred to at "mediational" because the mediate (i.e. go-between) between the environmental stimulus and the response. As shown in the diagram above, the mediational process comes after the stimulus and before the response. One of the major areas of study within the field of cognitive psychology is attention. Within this focus psychologists explore the key function of attention as it relates to the ability to discriminate between irrelevant and relevant data. Cognitive psychologists focus on better understanding memory and related processes. They study procedural memory, memory for the performance of specific actions, semantic memory, encyclopedic knowledge a person acquires, and episodic memory, the memory of autobiographical events. Some cognitive psychologists focus exclusively on mental processing as it relates to perception. These include physical senses (hearing, sight, touch, taste, and smell) as well as the cognitive process of interpreting these senses. Language processing and development is a major focus of cognitive psychology. This is a large and growing area of focus for cognitive psychologists. Primary areas of study include language acquistion, language formation, language as it relates to mood, etc., etc. This component of cognitive psychology focuses on the thoughts a person has about their own thoughts. Metacognition attempts to understand how effective people are at monitoring their own performance, how effectively individuals understand their mental capabilities, as well as their ability to apply cognitive strategies. While most branches of psychology focus on direct patient care, cognitive psychology focuses primary on research. Cognitive psychologist research, then develop, the methodologies used by psychologists in clinical environments. In fact, the work produced through the study of cognitive psychology is integrated into the modern disciplines of social psychology, abnormal psychology, educational psychology, personality psychology, developmental psychology, and economics. Cognitive therapy for the treatment of depression within the field of abnormal psychology is a result of psychological principles discovered through the study of cognitive psychology. Many of core aspects of modern social psychology are based on reserach performed within the field of cognitive psychology. Much of the understanding within the field of developmental psychology is based on cognitive psychology modeling. Modern theories of education are derived from prominent concepts set forth within the discipline of cognitive psychology, such as metacognition, declarative knowledge and knowledge organization. And in recent years many personality disorders have been treated using cognitive therapeutic approaches. Cognitive psychology is truly at the core of modern day psychology. Below we'll outline cogntive psychologies key features, methodologies, assumptions, areas of application, strengths and limitations. While many cognitive psychologists conduct basic research (theoretical) or applied research (aimed at finding solutions to real-world problems), they work in a number of other areas as well. Many work for government agencies, as eductors at colleges and universities, for private corporations and business, and as indepedent consultants. Common titles held by cognitive psychologists include director of research, industrial-organizational manager, university professor, human factors consultant and usability specialist. In recent years, cognitive psychologists have begun to play an important role in court room trials since they specialize in memory retention, and because eyewitness testimony is such an important component in jury trials. Research has illustrated that people witnessing events as they happen often forget, or misinterpret what they see. As a result, cognitive psychologists are frequently called upon to testify and participate in trial proceedings. Typically, the first step to becoming a cognitive psychologist is to earn a bachelor's degree from a regionally accredited college or university. While the bachelor degree can be obtained in any discipline, most graduate programs prefer candidates with a bachelor's degree in psychology, or a related field fo study. Since graduate schools are very competitive, we recommend earning a bachelor's degree in psychology, or some other behavioral science discipline. Following the completion of a bachelor's degree, students will need to earn either a master's degree or doctorate degree in psychology. Earning a master's degree in psychology is sufficient to practice in a limited number of entry-level career positions. To conduct research, teach or practice any aspect of cognitive psychology requires a doctorate degree in psychology from an APA accredited program. Cognitive psychologists tyically focus in one of three areas: research, teaching or treatment. Those involved in treatment may be required to obtain a license in the state where they're employed. To obtain a license, applicants must hold a doctoral degree in psychology, have completed a 1-year APA accredited internship and pass an exam administered by their state's psychology board. Certain research and teaching positions may not have state licensure requirements. Pay for psychologists vary widely. How much a cognitive psychology can earn is dependent on several factors including level of education, career path, position and experience. According to the U.S. Bureau of Labor Statistics the median salary for all psychologists is roughly $87,000. Psychologists working as professors at universities earn between $74,000 and $85,000 a year on average, while psychologists employed by scientific research centers and physicians' offices make between $100,000 and $110,000 a year, respectively. The highest paid psychologists work as industrial-organizational consultants with large corporations and typically make over $115,000 a year. As cognitive psychologists are qualified to work in academic, clinical, business and research environments, there is usually not shortage of job opportunities. However, the majority are employed in teaching and research positions as major colleges and universities. Recently, cognitive psychologists have been hired to work in the fields of organizational psychology, software development, usability analysis and human-computer interaction. Overall, the job outlook for cognitive psychologists over the next decade is strong.